Polycom VVX 501 IP Phone | 8x8, Inc. 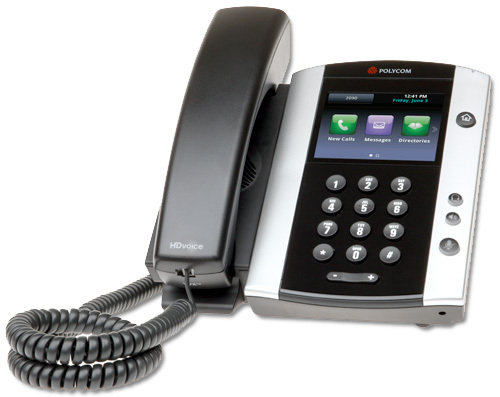 The Polycom VVX 501 IP phone is a new class of IP desk phone with extraordinary technology innovation. The Polycom VVX 500 is ideal for multitasking professionals, receptionists or group admins who require multi-call management with quick and responsive call handling. The VVX 501 also comes with a built-in Gigabit Ethernet bridge to connect a high speed device to your phone. 12 line keys – Use the standard 2 line keys for managing two live calls on your phone at the same time, and use the others as speed dial keys, or add-on Power Keys Service to manage up to 6 live calls at a time and monitor the call status of 6 other extensions — all without the need for a sidecar. Video capable — Option to add a VVX webcam for two-way video calls or for joining video conferences. Future-proof — Extensible technology platform for years of future apps and USB add-ons being developed for this game-changing new platform. Group Intercom Paging — Intercom to up to 23 paging groups that you define, or broadcast out to all other Polycom sets in your office.